SO AFTER A GREAT YEAR OF MEMORABLE PARTIES WE ARE CELEBRATING OUR 1ST YEAR BIRTHDAY! WE HAVE SO MANY TREATS FOR ALL YOU DUBSTERS. JOSHUA BLACK STRAIGHT FROM THE UK WILL BE PLAYING THE MAIN SET ON THE NIGHT. 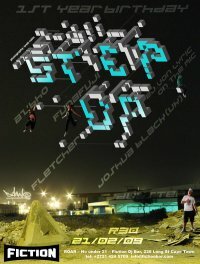 JOSHUA BLACK IS A VERY PROMINENT DUBSTEP PRODUCER FROM THE UK WHO PRODUCES ALONGSIDE ZED BIAS ON SIDE STEPPER RECORDS. HIS PRODUCTIONS HAVE VARIED INFLUENCES FROM THE UK BREAT BEAT SCENE, SO BE PREPARED TO HERE THE SICKEST DUBSTEP TRACKS ALONG WITH SOME BROKEN BEAT AND TWO STEP! JOSHUA BLACK ALSO RUNS THE EVER GROWING DUB SPOT NIGHT IN MANCHESTER ONCE A MONTH WITH CHIMPO AND ZED BIAS. HE WILL BE PLAYING SOME OF HIS OWN BEAUTIFULLY CRAFTED TUNES AS WELL AS SOME OF YOUR FAVOURITES. AND IF THAT WASN’T ENOUGH. WE ALSO HAVE AZ’BHO, AKA ASTROBOY, STRAIGHT OUTTA EDINBURGH TOWN DROPPING SOME SMOOTH MELODIC SOUNDS. AND IF EVEN THAT WASN’T ENOUGH WE HAVE OUR VERY OWN EJ VON LYRIC (GODESSA) ON THE MIC BRINGING HER POWERFUL RAGGA VOCALS AND ENERGETIC PRESENCE FOR THE NIGHT! R30 GETS U GUYS IN AND WE WILL HAVE LIMITED EDITION BUTAN STEP UP T-SHIRTS TO SELL AND 3 OF YOU LUCKY PEOPLE WILL WIN SOME! THIS IS NOT A PARTY TO MISS! Check out the Facebook event for more!